insecticidal soap-Complete coverage, especially of undersides of leaves, is essential. Repeat applications may be required. Some formulations are OMRI-listed for organic use. plant-derived essential oils (cottonseed, clove, garlic, etc.) have proven effective against mites. Some formulations are OMRI-listed for organic use. abamectin (Agri-Mek) at 0.009 to 0.019 lb ai/a. PHI 7 days. REI 12 hr. Retreatment interval 7 days. Do not exceed two sequential applications or 0.056 lb ai/a per season. bifenazate (Acramite 50WS) at 0.375 to 0.5 lb ai/a. PHI 3 days. REI 12 hr. Limit 1 field treatment per year. bifenazate (Floramite SC) at 0.063 to 0.125 lb/100 gal. PHI 3 days. REI 12 hr. Do not exceed 1 lb ai/a per season. Limit 2 treatments. For greenhouse application only. bifenthrin/avermectin (Athena) at 0.09 to 0.12 lb ai/a. PHI 7 days. REI 12 hr. Retreatment interval 10 days. Do not exceed 0.056 lb ai/a avermectin or 0.2 lb ai/a bifenthrin per season. bifenthrin/zeta-cypermethrin (Hero) at 0.1 lb ai/a. PHI 1 day. REI 12 hr. Retreatment interval 10 days. Do not exceed 0.42 lb ai/a per season. Limit 4 treatments. chlorfenapyr (Pylon) at 0.1 to 0.2 lb ai/a. PHI 0 days. REI 12 hr. Do not exceed 0.6 lb ai/a per season. Greenhouse only. Retreatment interval 5 days. Do not use on tomato varieties with a diameter of less than one inch when mature. cyflumetofen (Nealta) at 0.179 lb ai/a. PHI 3 days. REI 12 hr. Retreatment interval 14 days. Do not exceed 0.357 lb ai/a, Knockdown only. Application should be timed to coincide with recommended miticide treatment. etoxazole (TetraSan) at 0.025 to 0.625 lb ai/100 gal (covers about 20,000 sq ft). PHI 1 day. REI 12 hr. (indoor grown only). Do not exceed 2 applications per cropping season. Do not exceed 1.25 lb per acre per application. fenpyroximate (Miteus) at 0.105 lb ai/a. PHI 1 day. REI 12 hr. Do not exceed 0.21 lb ai/a per season. Limit 2 applications. Retreatment interval 14 days. hexythiazox (Onager) at 0.94 to 1.88 lb ai/a. PHI 1 day. REI 12 hr. One treatment. Greenhouse only. 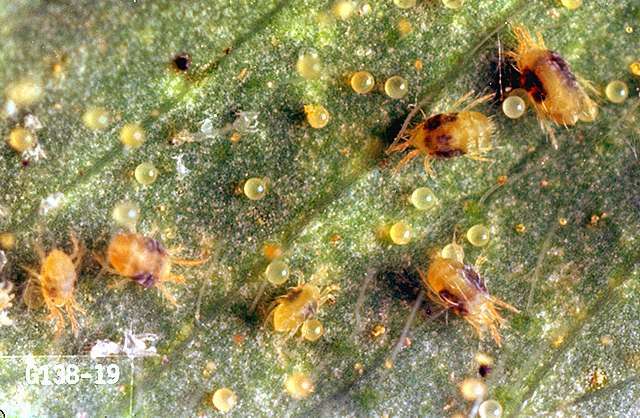 insecticidal soap (M-Pede) at 2% solution. See label for gal/a rate. PHI 0 days. REI 12 hr. Some formulations are OMRI-listed for organic use. spiromesifen (Oberon 2SC) at 0.11 to 0.13 lb ai/a PHI 1 day. REI 12 hr. Retreatment interval 7 days. Limit 3 treatments per year. Do not exceed 0.4 lb ai/a per season.